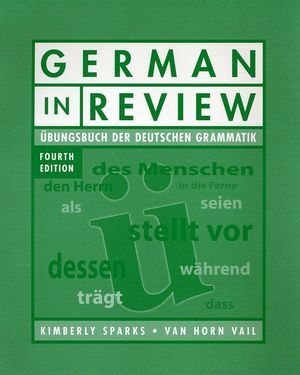 German in Review Classroom Manual: Ubungsbuch der deutschen Grammatik, 4th Edition. Recognizing that students in a second or third year course come from a wide variety of backgrounds and skill levels, German in Review is designed to even the playing field by letting all students come into the classroom on an equal footing. Kimberly Sparks is the author of German in Review Classroom Manual: Ubungsbuch der deutschen Grammatik, 4th Edition, published by Wiley.